In a world that is continuously connected with others through the internet, there is no definite distinction between the real world and the virtual world anymore. Because of this convergence of the two worlds, what people experience online may have an impact in real life. In Roland Wojak’s work titled Griefing Through the Virtual World: The Moral Status of Griefing, he specifically states, “…actions performed within virtual worlds are really still actions performed in the real world by a real person directed at another person through a particular medium with real-world consequences and effects.” Thus, all actions of individuals in the real and virtual world have consequences. What happens in the virtual world may reach beyond our computer screens and into real life. Cyberbullying extends to the real world. Most of us have witnessed bullying in schools. Some of us may have even been victims to bullying. In the more recent generation, there has been more effort put into educating people about the repercussions of bullying. However, bullying has been taken to a new level with technological advancements. Our society is not only concerned with bullies in the real world anymore. 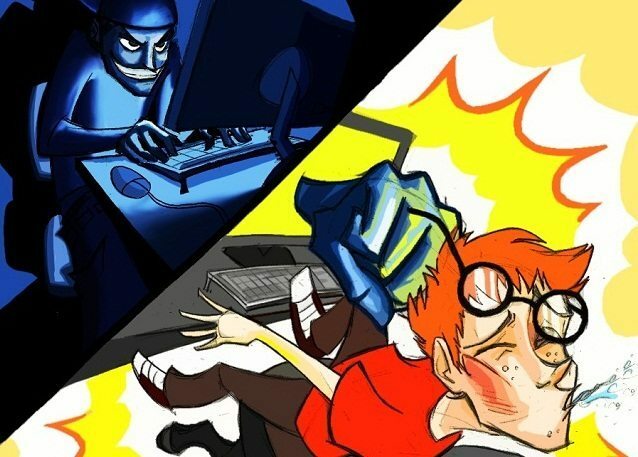 With the ability to interact with millions of people online, bullies also exist in the virtual world nowadays. This form of bullying can occur through basic online interactions, like social media and email, or even through online games. The term cyberbullying is used to refer to using electronic communication to bully a person, and the term griefing, a form of cyberbullying, is used to refer to the purposeful act of irritating or angering people in video games. In video games today, people are able to interact and play games together on online servers; people are no longer required to meet up at a particular location to play games with their friends. As a result of the introduction of this convenience, people can even play with other people they have not met, and may not ever meet. But, with this new form of gameplay, new problems dealing with cyberbullying and griefing has arisen for server administrators in many games. Wojak mentioned that many game administrators have been having a difficult time controlling griefing and cyberbullying, but I can not completely agree with this idea. In many games, there are regulations set in place to protect all players from cyberbullying and griefing. Players usually have an option to report other players who are not playing by the rules. Behaviors that warrant a possible report include the harassment of other players or deliberating sabotaging gameplay for other players. 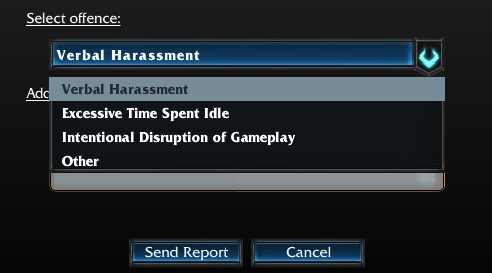 For example, when my friends play a multiplayer online game called League of Legends, they have an option to report bad player conduct. The reporting party will be asked to identify the reason in the report, and once the report if made, the gameplay is reviewed by the Tribunal, which is comprised of eligible players who are deemed worthy to make decisions leading to pardons or punishments. If a player is reported and found guilty of the charge, the suspension of that player’s account for a specific duration of time will result. Typically, first-time offenders will face a shorter suspension, and reoccurring offenses will result in longer account suspensions. In addition, when people are online, their online selves are extensions of their real selves. For example, in Second Life, a virtual game that Wojak mentioned, people became attached to their avatars because they assume the role of their characters. Since their characters are a direct representation of themselves in the game, players are affected by what happens to their avatar. While people can not directly experience what is happening, there are still indirect effects on the real life players that result from virtual actions. In fact, I have seen many of my friends get frustrated with other players while playing Grand Theft Auto V. In this game, people are able to run around and interact with other players online. If they choose to do so, they are even able to gun down other players and steal their money or cars. On one occasion, there was a player stalking the ATM, waiting to kill other players intending to deposit money into their banking accounts. This could get very irritating for people who just want to play the game without having to worry about being killed all the time. On the other hand, however, many of the players understand the risks of playing with other online players and are not as conflicted when they are killed. People who take the game too seriously are probably more likely to be negatively affected by the actions of other players. Thus, the degree of the effects may vary depending on the person. In my opinion, different people may be affected differently by griefing and cyberbullying. Those who are prone to being victims of real life bullying may also be those who are prone to other forms of bullying. In addition, different people handle bullying, griefing, and cyberbullying differently as well. It is possible that those who are more severely affected by griefing and cyberbullying are more predisposed to being more emotional and more easily disturbed by greifers and bullies. This is the same for real life bullying. There are people who are able to ignore their bullies and recover from attacks towards them, but there are also others who are more sensitive and can’t defend themselves. Below is a video of an online gameplay interaction between two players in Grand Theft Auto V. The video shows how a player purposely bullies another player. Warning: The following video contains explicit language and images. I don’t consider griefing to be as massive of a problem as Wojak makes it out to be. Like real life bullying, there are rules and regulations in place to protect people from being bullied in the virtual world . While cyberbullying and griefing can occur more easily behind the anonymity on the internet, it is a similar problem to bullying in the real world. In my opinion, Wojak makes it sound like all individuals who encounter griefing and cyberbullying will inevitably fall into depression or end up suicidal. But this is not the case. People in the virtual world handle cyberbullying differently, just as people in the real world do. Some people are just more emotional and sensitive, so they are affected to a greater degree by bullying, cyberbullying, and griefing than others.